Dr Matt Prescott Interview: Campaigner & Energy Specialist. 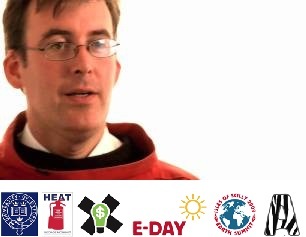 Interview With: Dr Matt Prescott – Committed Campaigner & Energy Saving Specialist. I first came across Dr Matt Prescott whilst I was researching the energy saving benefits of using LED lighting. After reading about his courageous ‘Ban The Bulb’ campaign I turned my attention to researching the man himself, and this is where the worms flew out the can. This once inquisitive young boy who’s love for nature resulted in marauding around Snowdonia looking for wildlife has now become a leading figure in the way we approach powering our world. Over his lengthy reign of analysis, awareness and action; concentrating on the planet’s conservation, energy use and general upkeep, he has pitched his wit to the elite, teamed up with household environmentalists and advised governments on how you and I can be kinder to the environment. It isn’t all about the BBC, the board room and the diagram charts, Dr Matt Prescott has put in the ground work. He spent years of studying, travelling and working, cultivating new ideas on how to improve our existence on planet earth. He has spearheaded several campaigns from E-Day to the ‘Ban The Bulb’ campaign, along the way gaining accolades from his peers and recognition in national and international media. 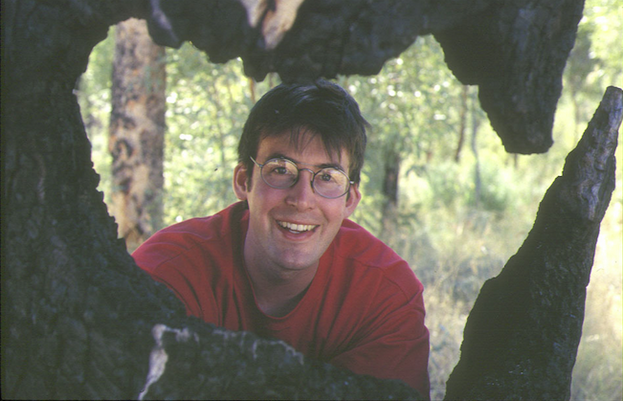 Direct Trade Supplies are honoured to have such a well respected, driven and intelligent individual to feature on our website, so with no further ado, here is the interview with Dr Matt Prescott. For around ten years you have been involved in energy saving projects, at both national and international levels – did this commitment stem from a natural desire to improve the planet or was it always part of your plan after studying? I’ve always loved nature and I found it strange that we do so many things that damage the environment we all rely upon and enjoy. As a small boy, growing up in Snowdonia, I learnt to find legless lizards called slow worms and this gave me an early appreciation that the actions of humans can be both harmful and beneficial. For example, I can remember going on one of my favourite walks and finding that a whole hillside had been cleared for timber. Although this really upset me, I also knew that opening up the canopy in this way would probably be good for the reptiles that I loved searching for, so from even an early age I’ve known that it’s difficult and complicated to do the right thing for the environment. Was there a particular turning point in your research that shocked you into action and ultimately spurred you on even more? 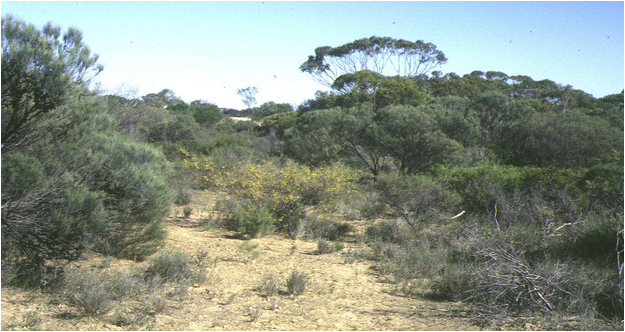 The biggest turning point in my life came while I was studying the pollination of rare Acacia plants in Western Australia. The three species I was studying in the Outback were approximately down to their last 50 individuals and the land they grew on had been completely bulldozed as far as the horizon, this was carried out for wheat farming. The insects needed for pollination had also been wiped out by pesticides, I found the whole experience immensely shocking. To top things off, the worst floods in 200 years hit the area I was working on, resulting in large amounts of soil washing away and opening up huge gullies in the fields, sweeping mud into all of the nearby towns. As an ecologist, it really was an overwhelming and apocalyptic moment of realisation, as the problems were so immense! My time in this farming community was also great fun and I came to love the straight talking and rugged people that have forged the wheatbelt out of the wilderness. They were often under the threat that the land would be taken off them by the government if they didn’t clear it. The unusual nature I encountered, either on the scraps of plantation left by the side of roads or around poisonous plants that couldn’t be grazed by sheep, were still far more exciting to the biologist in me, than anything that could be found on the Moon. My particular highlight came when I was lucky enough to find another 100 individuals of one of the rarest species I was working on. When I told the farmer I had found more Acacia plants on this land, his wife was absolutely delighted, so much so she rounded up the local women’s group to take a look and host a celebratory picnic. I suddenly realised that these previously doomed plants were now safe because the wives of almost every local farmer were now on their side, and this was quite a revelation. From this point forward, I’ve always tried to communicate directly and plainly to the people best able to change the way we all live and to reach outside the scientific community for help and ideas. During your time researching and campaigning what was your main aim or end goal? I have always wanted to understand why things are the way they are and to offer practical environmental solutions to everyday problems. Often the central problem is not a lack of knowledge or technology, it is simply a lack of imagination or willingness to listen to those who have different points of view or priorities. I basically enjoy the process of finding new ideas and ways of living. One of the most enjoyable and rewarding projects I’ve organised involved asking children to make puppets of an interesting animal that lived on an island somewhere in the world. With this basic challenge, they all went off and found out about tree kangaroos, sea slugs, lemurs, echidnas and numerous other weird and wonderful creatures that excited them. The children made some simply incredible mini-masterpieces, which I’m pretty sure both they and I will always remember. These particularly successful and rewarding moments are relatively few and far between, so its great when you can successfully encourage everyone to rise to a challenge with such enjoyment and do it so magnificently. You must have met some pretty inspirational people along the way, does anyone stand out in particular? I have met many inspirational people over the years and most of my heroes are zoologists who have dedicated their lives to helping specific species. These include many of my friends at Oxford University’s Wildlife Conservation Research Unit (WildCRU). On a more personal level, Dr Rosie Trevelyan selected me to go on a rainforest ecology training course in Uganda in 1995 and this mind-blowing experience really changed the whole course of my life. Her advice and encouragement was definitely what enabled me to become a professional scientist. 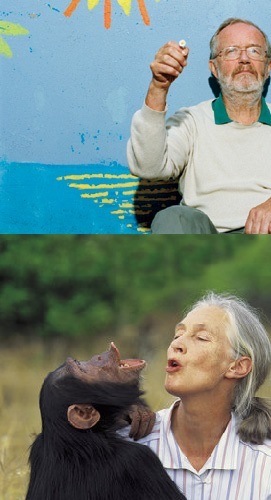 I also feel very lucky to have met a few environmental super heroes such as Norman Myers (who has helped to identify and secure funding for many of the world’s most biodiverse and endangered regions) and Jane Goodall (who helped us to realise that humans are not alone in having personalities, emotions and an ability to make tools). I’m pretty sure that both Norman and Jane will have long-lasting legacies which will leave future generations with a better chance of thriving and surviving on this planet. What has been the biggest hurdles to get over – was it changing the culture, financial difficulties or something else? Funding constraints are a semi-permanent fact of life, but I try not to spend too much time worrying about it and to live as positively and simply as possible. However, harsh economic realities often kick in and when they do I try to think through what I have done wrong and to pick another more promising direction which incorporates all of the painful lessons I previously learnt. Working on the environment teaches you a lot about the fickleness and strangeness of human priorities. We care about polar bears, but not the fish or icebergs they rely upon for food. We love butterflies, but we aren’t prepared to do without pesticides and so on. These erratic tendencies can result in great generosity, emotional highs and achievements when you are doing something in fashion but also great disappointments, lows and failures when the timing or topic isn’t quite right. Increasingly, my solution has been to team up with other people who are good at different things, this can help to share the burden and offers fresh hope when my own reserves are running low. I read that the BBC planned to team up with you to launch ‘Planet Relief’, is it true that the BBC pulled out of this project claiming ‘it wasn’t their duty to save the planet’? – If so, why do you think they did this. Yes, I spent around 18 months helping to organise an environmental equivalent to Comic Relief for Jon Plowman, the Head of BBC Comedy. This project was both wildly exciting to attempt and deeply depressing when it ran into strong political headwinds. I still think this was a huge missed opportunity, as we urgently need to find new ways of discussing the environmental sustainability and solutions to big, big problems. But at the same time, I’ve also learnt that change takes time and to a certain extent you have to wait for others to be ready to confront difficult things. If we can’t laugh at our problems and disagreements, as a society, then we’re certainly in a lot of trouble, so I sincerely hope that Planet Relief will end up being reincarnated by the BBC one day, in one form or another. Having said this I must add that BBC has managed to help society discuss and address child abuse and poverty via its Children in Need and Comic Relief charity nights. I can remember when these were once totally taboo and ignored subjects, so I remain optimistic that the BBC will eventually do their bit to encourage mass participation in environmental protection and mainstream sustainability. I have read that you helped to organise and action the largest energy saving day recorded worldwide, can you tell us a little bit about E-Day? 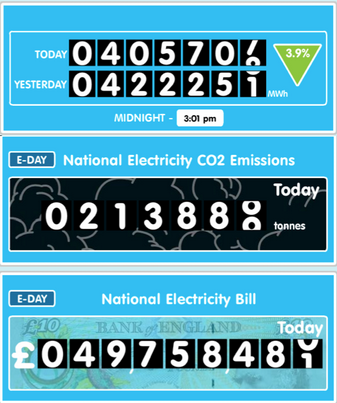 Whilst I was at the BBC, I had negotiated permission to measure the UK’s electricity use as part of a live TV programme and we had all sorts of fun ideas ready for helping our audience to save energy and cut their bills. With a TV audience of 7 – 8 million people it should have been possible to have 1 – 2 power stations turned off. Once there wasn’t a TV audience to interact with everything became a lot tougher. I had to concentrate on motivating all of the organisations who had agreed to do something positive, on developing the technologies needed to visualise the country’s energy usage on the internet in an easy to use and clear manner. I would therefore say that the first national E-Day was only a partial success and I really had to wait for the second E-Day held on the Isles of Scilly for everything to work well. These islands were selected because they have a single undersea power line connecting the islands to the national grid, this meant that I could show in real time online just how much electricity everyone in this community was using. 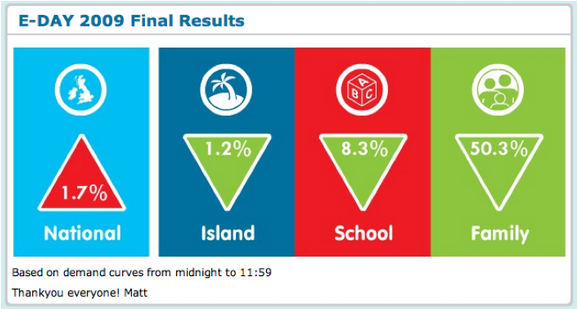 In comparison to the mainland, electricity use dropped by 3% across all of the islands (the equivalent of 1 – 2 power stations if scaled up nationally), 10% in the local school (the equivalent of 3 – 6 power stations if scaled up nationally) and 52% in a family home (the equivalent of about 20 power stations nationally). This result showed me the value of working with schools where everyone was willing to give things a go, they really helped individuals to feel excited and positive about change. I found a really dynamic bunch of “can do” people on the Isles of Scilly and they are one of the best reasons for hope I have encountered to date. Do you think that LED lights should be compulsory fittings across the world/what dangers are attached to the alternatives that are currently being used? The two main things I wanted to achieve when I set up the Ban The Bulb energy efficiency campaign was to create a deadline for action and to avoid being prescriptive about the technology we would end up using – other than it should be the most efficient that had the potential to be scaled up. Over time, as new discoveries and innovations are made, the best solutions will obviously change, so with this in mind I would prefer that we focused on bringing new and better models into use on a rolling basis, rather than endorsing and concentrating on today’s winner. One of best things about the Ban The Bulb campaign was that it helped to break the logjam which previously prevented traditional incandescent light bulbs from being displaced by more energy efficient alternatives for over 120 years. The established light bulb designs had been mass-produced for decades and were so cheap to buy that nobody really discussed how much they cost to use. Markets don’t always adjust themselves or propose the solutions we could do with using, so I hope that the Ban The Bulb campaign demonstrated that governments can play a useful role in setting socially or environmentally beneficial goals and leaving businesses to achieve them. The proactive use of laws and taxes is still out of fashion, but I see the correct setting of both of these as the core roles of government. The market is geared towards solving its own money making problems and cannot be relied upon to solve societies problems for them, especially in a reliable or timely fashion, as the recent financial crisis so eloquently demonstrates. At this present time LEDs are attractive for manufacturers to develop, retailers to sell and consumers to buy, yet this virtuous cycle definitely didn’t happen by magic, and I’m pretty sure that we would still be using wasteful incandescents, just as we are still allowing rubbish homes to be built, if governments hadn’t decided to create new laws. I take some pride in having set up the Ban The Bulb campaign, and focusing on energy efficiency before it was trendy, but I’m always conscious that the campaign’s worldwide success has only been achieved because so many others adopted these ideas and made them their own. I think the internet played a big part in making change possible in this way, because as soon as the BBC published a couple of articles for me, they immediately went all round the world and reached millions of people simultaneously. 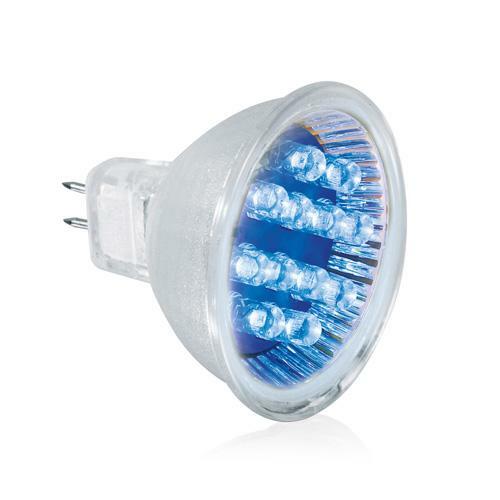 In terms of individual technologies, LEDs are certainly one of the most exciting options and their use has really been fast tracked because consumers didn’t like CFLs (Compact Fluorescent Lamps) and Chinese factories leapfrogged from making incandescents to LEDs as a result. However, given the rate of innovation currently being seen in the lighting industry I wouldn’t make LEDs compulsory. Instead I would probably give the whole industry fair warning that continued improvements in energy efficiency are going to be required. Ideally, we should simply aim to improve the energy using performance of all energy using products and their activities on a consistent basis; perhaps by 10 – 50% every 10 years. We got to the Moon by setting this sort of seemingly impossible target, so I think we could achieve a great deal by being ambitious when it comes to upgrading and improving our day-to-day activities and the associated technologies that go with it. Does a sustainable energy saving planet really exist? If it does, could you put a date on when it’ll be? If everyone on the planet had access to the best technologies and adequate funds, governments demanded less pollution of our air, land and sea, and businesses and individuals were incentivised to achieve sky-high levels of waste reduction, recycling and renewable energy use – we might get closer to living on a sustainable planet. Right now, with 7 – 8 billion people on the planet and everyone wanting more of everything, we are on a very dangerous and unpredictable path. There is still a huge gap between the rhetoric used to discuss issues such as climate change and the actual actions being taken to change reality. For example global concentrations of CO2 in the atmosphere are still rising after 30+ years of talking about cutting emissions. However, humans can be truly amazing when stirred, so only a fool would write off the possibility of us getting our act together on a monumental scale. The main danger is that we underestimate the numerous risks we are taking with the biosphere that supports our existence; and that we end up fighting over a greatly diminished pool of finite natural resources, limited number of safe places to live and insecure sources of food and water, only until its too late to do anything game changing to improve the situation. On the other hand, if we decided to share what we know and help others avoid our mistakes there’s a considerable amount that could be achieved over the next 20 – 50 years. What are your plans for the future / is there anything exciting in the pipeline? Recently I’ve co-founded a company called the Environmental Rating Agency which is trying to find new ways of integrating world class scientific knowledge and data into the financial markets. Both scientists and business leaders understand and care about risk, so I think that encouraging co-operation in this area of common ground offers a better hope for the future, a lot more than financial measurements or scientific detail can ever achieve on its own. 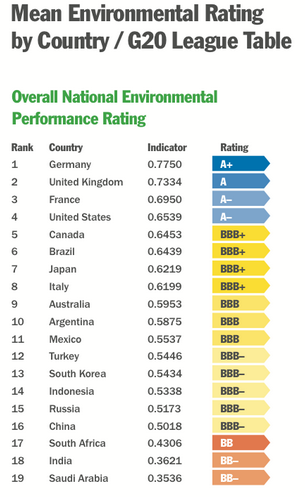 BBC News Online helped to publicise our first report assessing the environmental performance of the G20 countries and I think this approach has huge potential when it comes to bringing environmental risks into financial decision-making. I still retain a strong passion for encouraging greater energy efficiency and I think we should aim to halve the energy use of pretty much every energy-using device or activity. The best-in-class, normally manage a good level of efficiency in this already, so there is nothing impossible in mainstreaming this suggestion across entire categories of technology and lifestyle. Homes remain particularly ripe for being better made and upgraded in terms of their energy efficiency. Having had so many failures and only a few successes, it’s very hard to offer much transferable advice, other than to say that it is always worth giving what you care about a go and trying your best to make a difference. 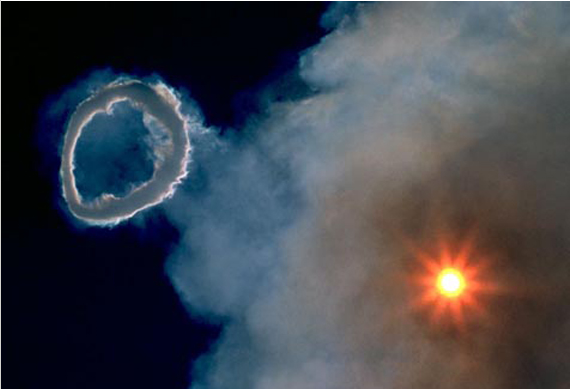 You can’t expect anyone else to notice or care, so you should do what feels right and simply give it your all. If you succeed you’ll feel fabulous and if you fail you’ll at least know that you tried. Previous Post:Interview With: Robert Bedner @ Research + Design, Pioneers Of Biophilic Design & Architecture. Are usually best way to seal off around marker lights since none seem to come, with gaskets, I had been thinking of making a keeps out if mastic tape, any more ideas? not mind. Is it simply me or does it look like a few of these responses look like they are written by brain dead individuals? understanding something entirely, but this piece of writing offers good understanding even.